The top made of an old oak rafter. It is 2 m long, 1 m wide, 10 cm thick. 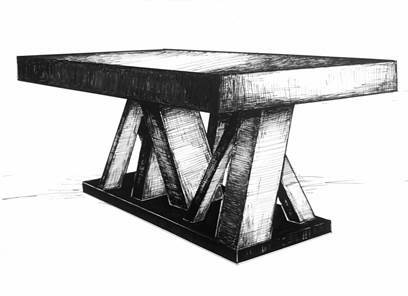 Table legs are 8 asymmetrically arranged old rafters of different thickness. The table base is a 7 cm-thick oak board. 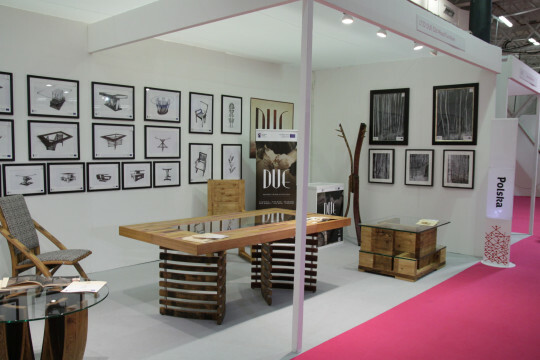 We were at Dubai’s INDEX 2017 in May and at London’s prestigious 100%DESIGN fair in September. 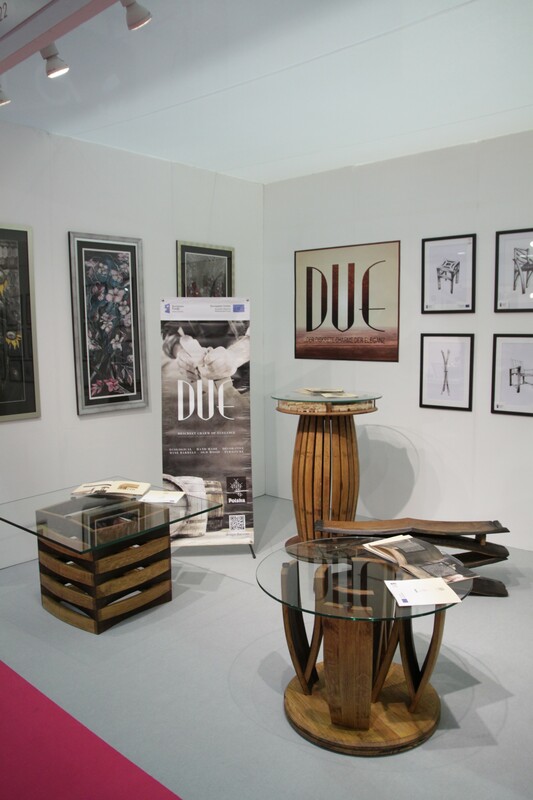 In London, we presented the latest collection of dining and coffee tables – “DUE – OLD WOOD FURNITURE”. 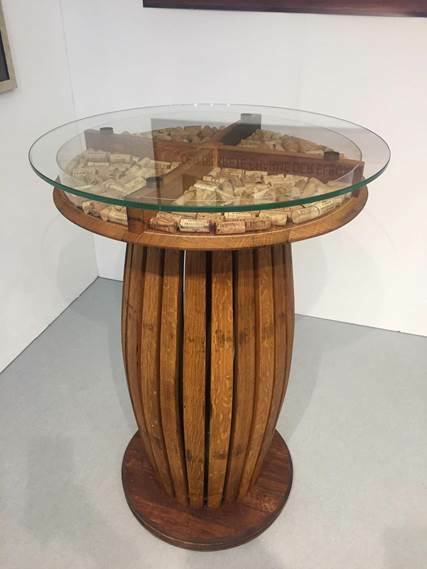 We were 100% right to see London as a place of sophisticated forms and realisations following the fair’s clear message – 100%DESIGN – being its name at the same time. We had a plan not only “not to lag behind”, but also to surprise. We made the plan come true as confirmed by many of our guests. 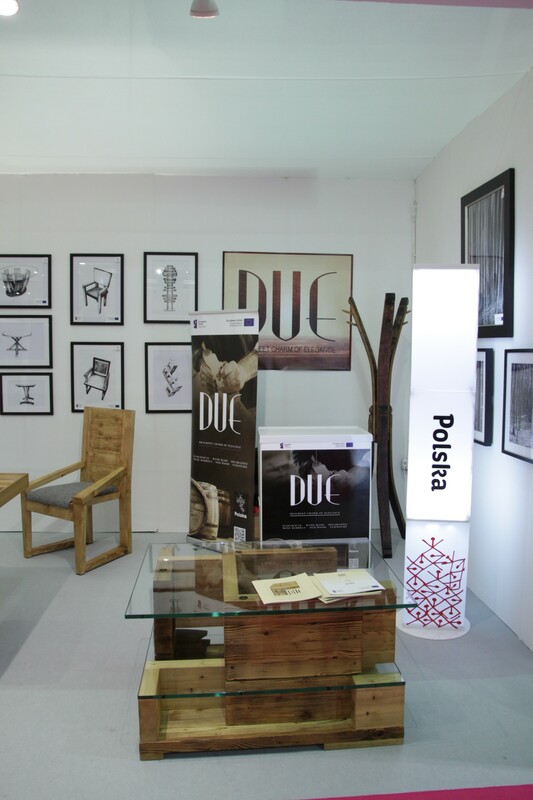 DUE’s booth was visited by nearly 200 guests, in particular by interior designers and other professional designers. The result is really good. Please find DUE’s booth photo coverage below. We covered 24 m2. It was well enough. We presented 9 finished pieces of furniture and over a dozen prints of advanced visions of our products, in particular tables. 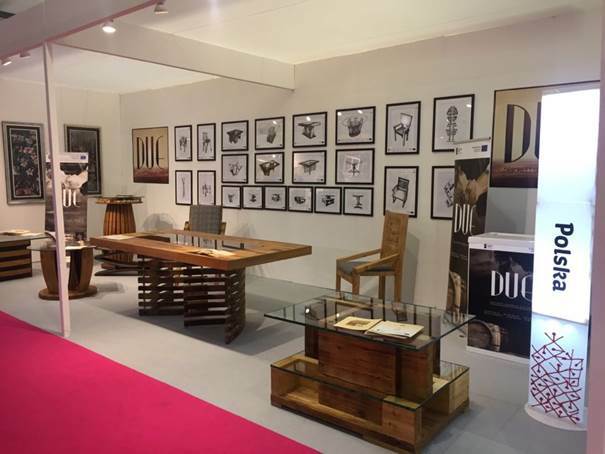 DUE DESIGN’s main exhibit was the WINGS table made entirely of 225- and 400-litre barrel elements. The upholstered SOLEA chair is made of barrel elements as well. We presented printed concepts of other tables made of old wood and wine barrels. The fairly aesthetic prints solicited vivid interest among our guests, many of whom photographed them. Our MANHATTAN coffee table, which is actually a large triple-top side table made of old wood, was found intriguing. It is an epic table of about 100 kg in weight. Some of our guests felt moved, others – provoked. We made the GEO chair as a counterpoint. Two coffee tables – TULIP and COFFER, were a perfect duo. Our guests could not decide which one was dominant, but every true duo is balanced after all. DIE KORKENMASCHINE marked the corner of our booth. It did not go unnoticed by our visitors who immortalised it by taking numerous photos and a few selfies. Indeed, it is a particularly neat piece of furniture which can decorate any wine cellar. 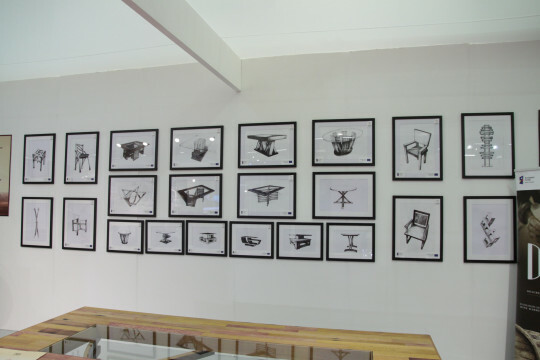 Our exhibition was somewhat a performance, a proclamation of nature and the ecological approach we follow in making our furniture. We dazzled our guests with paintings and photos of trees and flowers. Our furniture is all about wood, yet we do not cut down trees (!). We get wood from… dumps and on the way to an incineration plant. In fact, trees should grow and proudly pose as they do in the paintings and photos below. A certain gifted Kraków painter humanised and empowered trees with affection. After all, every tree, which has not been cut down yet, belongs to US. The fair was a success. Our furniture received a lot of praise for being unique, aesthetic, marvellous, bold, ecological, sophisticated, etc. Not to say that our prices were considered reasonable and even… predatory. This is all very flattering to us. We are awaiting orders. 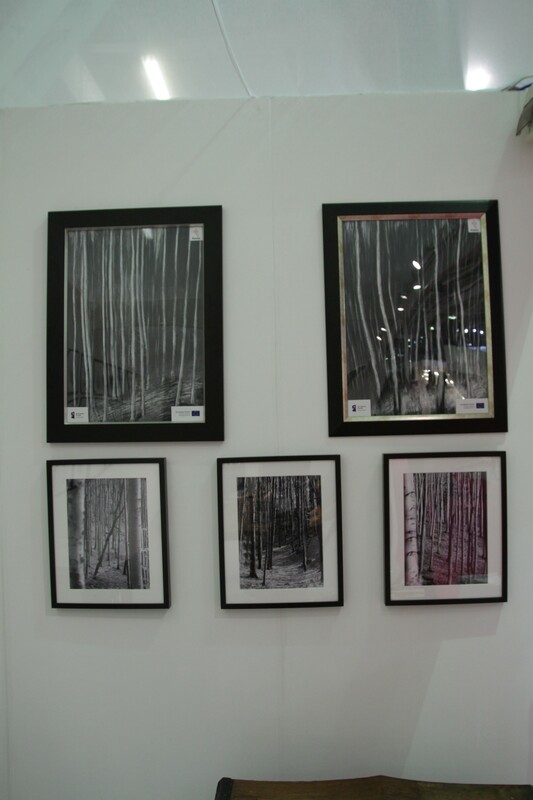 It is a photograph of the DUE booth at the fairs in Dubai. It covers 15 m2. Small is beautiful! The DUE emblem was “wine barrel furniture”. It was clear, although DUE makes furniture of old wood as well. The walls are covered with graphics of DUE realisations, and a DUE designer’s pastels are on the left side. 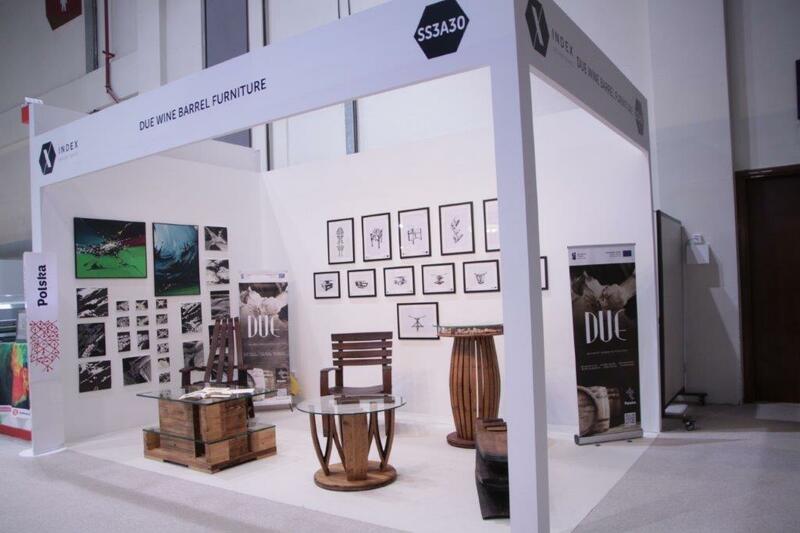 The DUE booth was visited by about 150 people, including 100 natural persons, in particular residents of Dubai. About 50 guests were representatives of various companies, most often interior design companies. So the fair statistics were good. DUE’s pre-Dubai target was 100 guests. DUE premiered its realisations at the main international fairs. As with every premiere, it felt a bit stressful, since collections and design concepts were subject to rating. Who can rate a furniture collection reliably? Certainly, interior designers‘ verdicts may be conclusive. After all, not hairdressers’ and cooks’ verdicts – it is obvious. Nevertheless, contemporary hairdressers and cooks are somewhat designers in their fields. Interior designers’ verdict was unanimously positive. None of them was against. They stressed the courage and originality of material and form. Realisations’ carpentry technique was faultless which was not left unnoticed. Product uniqueness is an important feature, especially if this originality is constructive. Such features were raised by guests of the DUE exhibition. They did not spare praise. Let us introduce the realisations presented at the INDEX Fairs 2017. We love wine and everything that is associated with it. On the blog we present: bacchanalian motifs in painting and sculpture, inspirational arrangements of interiors, gardens and wine cellars, as well as beautiful objects that associate with wine and art. We divided the topic of the blog into seven categories: Interior Design, Architecture, Painting, Objects, Wine Cellars, Sculpture, Wine.